For every choice you make, there are many choices you never made. 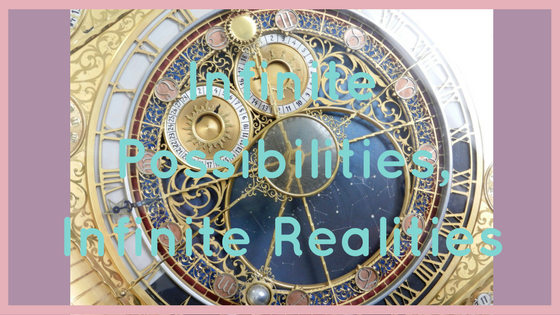 Each reality explores a single possibility out of infinite. In an energetic, non-physical sense, everything is happening at the same time. Our past, is an alternate version’s present. Their present is our future. Or a possible future for us. Time still flows at the same rate in these other realities, but the events of each individual versions of us happened at different points in their lives compared to ours. So, each exploration of reality, has many different events happening, at the exact same moment, they are just being lived by alternate versions of ourselves. When we act as if something is already happening or has happened to us, in our current physical reality, we are only acting on the present moment of an alternate reality where an alternate version of ourselves has already achieved or is currently achieving exactly what it is we really want. We only have a short time on this earth and we don’t know when our time will end. So, we have an obligation to do everything in our power, now, to get to where we want to go in this life. Everything we do in this life will only add to the next life and all things will be added to after we die. Firstly, we need to recognise that we cannot do it all, be it all or have it all right now. But we can be striving towards the things we want and need most in our lives. We may not die having achieved everything we set out to achieve, but, when we do die, have we tried our absolute hardest? Did we get up again after we fell? Did we recognise when we needed to take a break and rest for a while to ensure we can rise higher the next time we tried? Did we trust our intuition and recognise when we needed to course correct? We must begin our journey with the end in mind. If we do not know where we are going then how do we know that we have arrived? What is it you hope to achieve? Why do you want to achieve this? What must you do every, single day to achieve this goal? What are the major milestones that will tell you if you are on the right track to achieving this goal? You may not necessarily know the answers to these questions straight away but, as in my previous post (Manifesting your Desired Reality), searching for answers, pondering on things that have been learned, praying and meditating for guidance and surrendering to the will of the Divine, you will eventually learn truth and will be able to act on it. Then we visualise. Imagine yourself having already achieved your desire. Flood your mind and body with the emotions of these experiences. How will you feel when you have accomplished your heart’s desires? Allow yourself to feel that now, in the present moment. If we think in present tense, our brains cannot tell the difference between what is now and what is yet to come. The more we do this, the more we tell ourselves a positive thing is true and real for us in this exact moment, the more we feel and believe that it is indeed true. The more we feel and believe it, the more aligned to it we are and the more we will act on it. The more we act on it, the more likely it is to actually come into our physical reality. So focus more on how you want to feel and then act as if it is already happening for you. It will take time. It will be hard. At points in your life, you will feel like giving up. But, “it’s what you do when you least want to that matters the most” and “great men and women behave in precisely the same way when they are under enormous pressure as when they are not”. If you want something you need to constantly behave in a manner that can get you exactly what it is you really want, even when, perhaps most especially, when it gets really hard. You can achieve what you set out to achieve as long as you truly believe it, you consistently act on it and it is truly meant for your Highest Good. Let go of how you think your life should look like and focus more on how it should FEEL like. 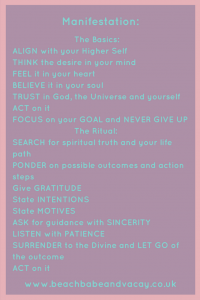 Feel free to save and print off the manifestation checklist as a constant reminder of what we need to do to get to where we want to go!